Background: A large number of disorders and their symptoms emerge from deficiency or overproduction of specific metabolites has drawn the attention for the discovery of new therapeutic agents for the treatment of disorders. Various approaches such as computational drug design have provided the new methodology for the selection and evaluation of target protein and the lead compound mechanistically. 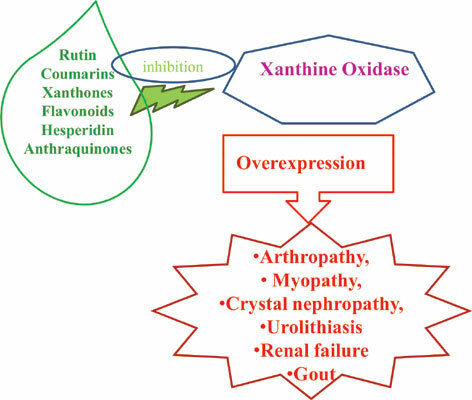 For instance, the overproduction of xanthine oxidase causes the accumulation of uric acid which can prompt gout. Objective: In the present study we critically discussed the various techniques such as 3-D QSAR and molecular docking for the study of the natural based xanthine oxidase inhibitors with their mechanistic insight into the interaction of xanthine oxidase and various natural leads. Conclusion: The computational studies of deferent natural compounds were discussed as a result the flavonoids, anthraquinones, xanthones shown the remarkable inhibitory potential for xanthine oxidase inhibition moreover the flavonoids such as hesperidin and rutin were found as promising candidates for further exploration. In silico docking, Xanthine oxidase, Natural derivatives, Flavonoids, 3D QSAR, CADD.